Once a burger, always a burger? I don’t think so! I’ve had my share of killed, dried out patties, served on soggy pieces of “bread” with nothing other than mayo and ketchup to hold them together. Though, let’s be honest, I’ve never had that horrific version, but some of burger wanna-bees have come pretty close. The burger wasn’t on the menu tonight. In fact, I was craving sushi, Indian, or perhaps a baby burrito from Gordo’s. That’s where my triplet entered with a brilliant idea “Let’s have a burger!” “You want a burger?” I questioned. “Well, then you need a burger.” As the phrase escaped my lips, I thought there was something familiar. I almost sang songed it to myself. 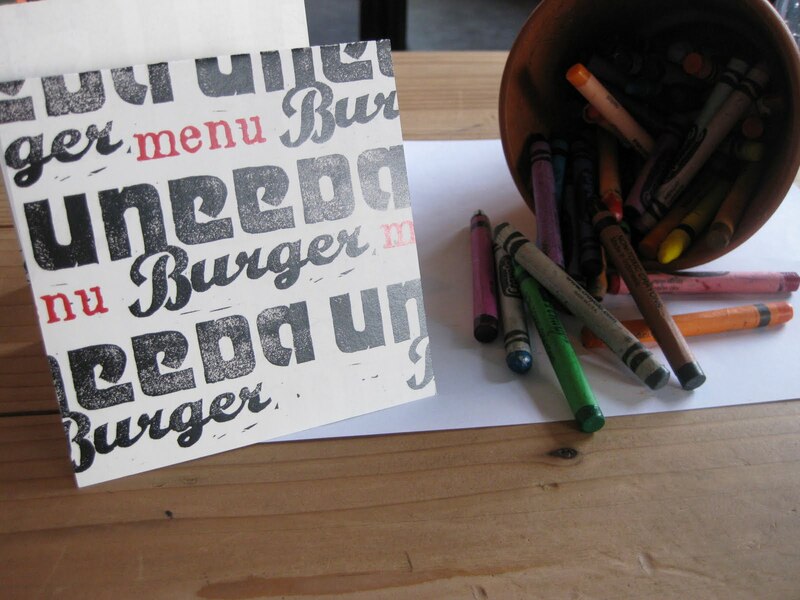 “Youuuuuu neeeeed a burgeeeaaaaahr.” And that’s when it hit me (like a buttered bun hits the hot grill) – we need to go to Uneedaburger! 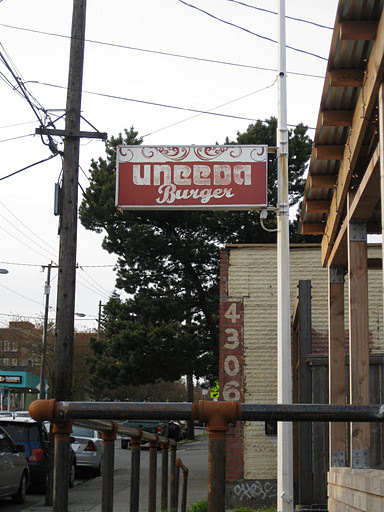 Conveniently located just a few miles away (4302 Fremont Ave. N. in Seattle, WA), Uneedaburger was our dinner destination tonight. From the first sight, this Fremont neighborhood location had promise. 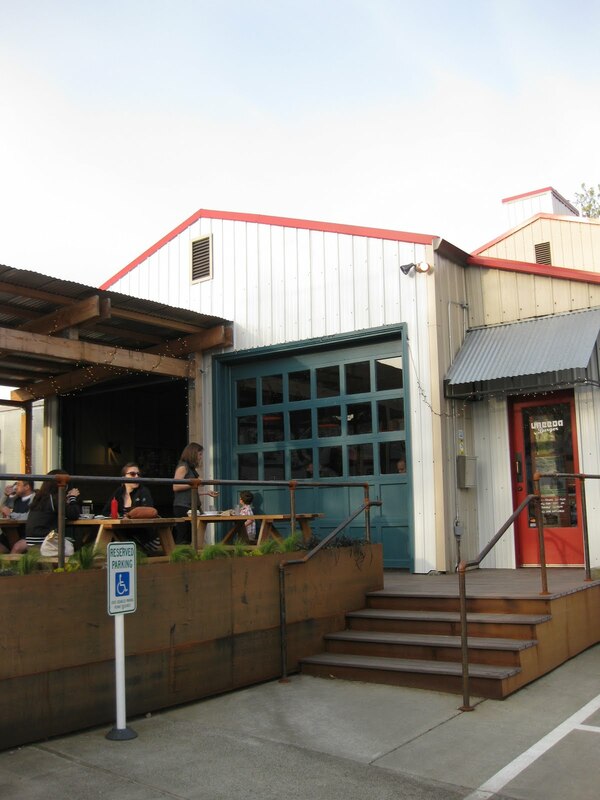 With large garage doors and outside seating, it reminded me of summer (something we don’t see here too often). We walked in and considered the menu. Working backwards, we first chose Empire Ice Cream hand dipped shake (in chocolate)– $5.00 and Chili & Cheese Fries:– $4.50 first, it was time to decide on the burger. My triplet went for a 1/4# with a fried egg and cheddar. I decided to go along with the chili theme and selected #5: Sonora burger with roasted chili relish, jack cheese and cilantro (medium rare please!) $8. While waiting, we re-discovered our childhood with the help of crayons and Hangman. Dessert arrived first. 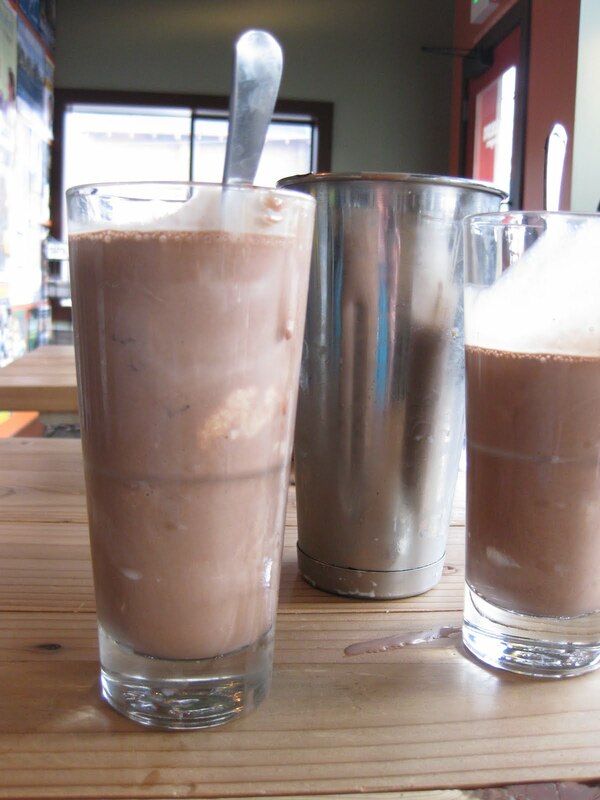 I’m not sure how people attack these milk shakes by themselves. We had a hard time finishing up our shared milkshake. But, boy were they good! 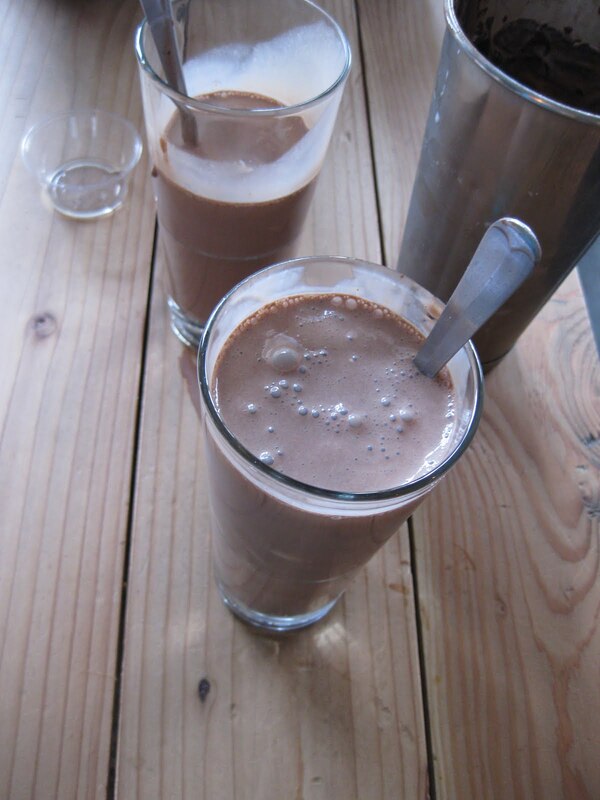 Rich, decadent, sweet and cold (Summer, where are you? This would be your perfect accompaniment). And then the main attraction of the evening arrived! 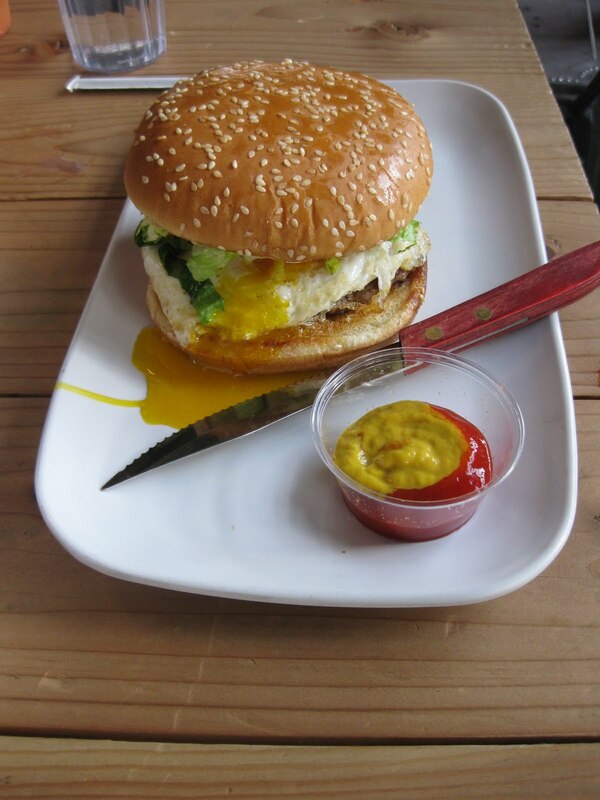 Here’s Anna’s burger, up-close-and-personal, with the perfect fried egg – the yolk oozing out. I can’t speak for her burger, but mine was perfect. Medium-rare, just like requested, the burger wasn’t overloaded with unnecessary toppings, which allowed each topping to play its role. 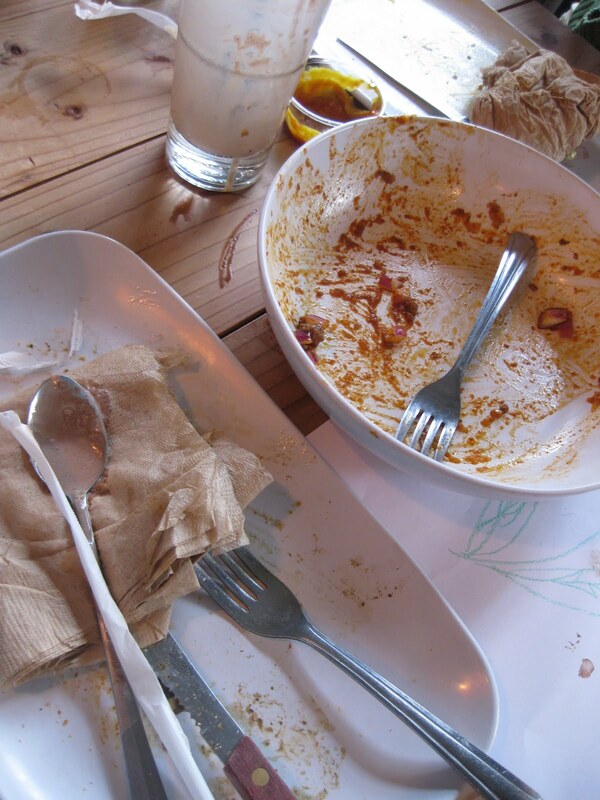 (Although, I actually couldn’t taste the cilantro – pity). 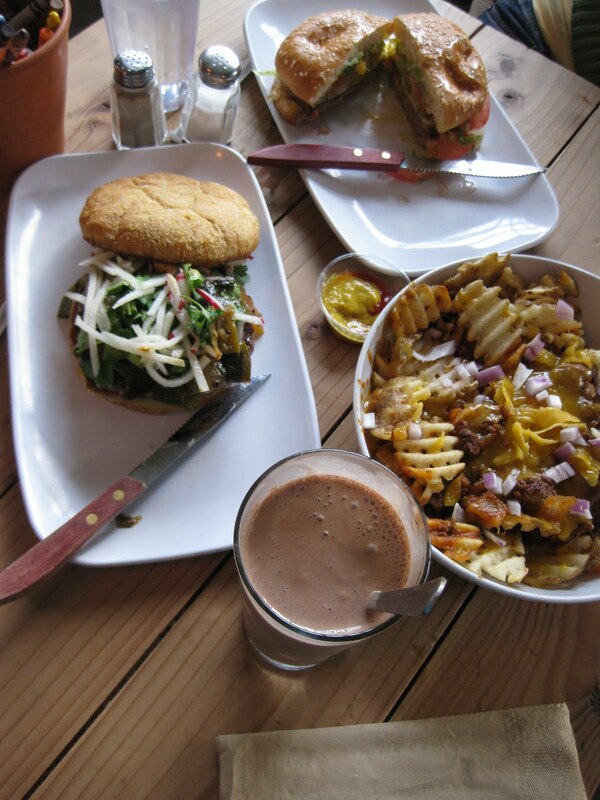 The burger had a nice surprise – matchsticks of pickled radishes. Remember the buns I spoke of in the beginning of the post? 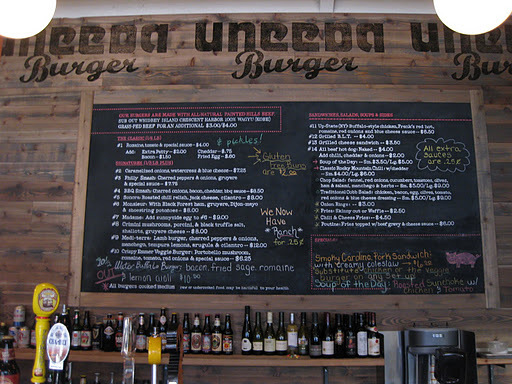 Well, I’m happy to say the Uneedaburger got their buns right. I bet they butter them up and slap them on top a hot griddle. The end result is “soft of the inside, tough (crunchy) on the outside” – sounds like someone you know? We probably should’ve walked back home to work out at least one single sip of the milkshake or a waffle fry covered with chili and melted cheese. Instead, we rolled into the car and drove back home for tea with ginger and lemon to soothe our overextended stomachs. And I have to give two thumbs up to the service – courteous, efficient and friendly! Thank you. this looks flipping amazing!!!! and now I want a burger. of course. yeah this is really a great post i love to know about it.